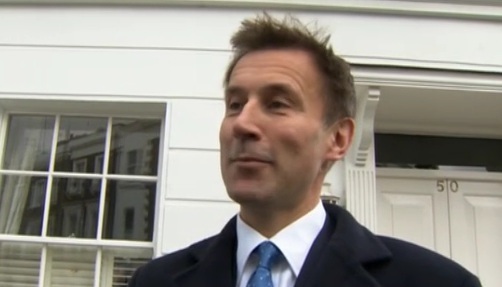 Will Number 10’s delaying tactics work with Hunt? Could there be surprises in the Sunday papers? So far, at least, the Cameron tactic of say they must wait for Leveson. not expected for some weeks, has managed to hold in the Jeremy Hunt affair. The problem Dave’s got is that Leveson won’t be ruling on the affair – that’s for the PM. Hunt might say that he didn’t know what his SPAD was doing but that doesn’t appear to be a defence. He’s responsible anyway. Ladbrokes seems to be the only bookmaker operating a cabinet next exit market this afternoon. Hunt is at 4/5. How the Sundays cover this could be crucial. Is Greece about to blow the Eurocrisis open again? What will the elections do to the bailout settlement? Itâ€™s unsurprising that with the Republican primaries, the French presidential election, the London mayorality and local elections in Britain all taking place within April or early May, thereâ€™s not been much coverage given to another legislative election taking place next week. Perhaps we should. Elections in that Greece have rarely carried as much import to the rest of the world as they do now. There are two simple reasons for this, both linked to the Euro. Firstly, an uncontrolled Greek default would throw a huge amount of uncertainty back into the global financial system that is only just recovering from the last crisis. Secondly, Greece is the weakest link in the Euro chain and a Greek parliament that refused to dance to the tune of those who would fund its borrowings would throw into doubt the entire EU project. That these will be historic elections is in no doubt. In the eleven general elections in Greece from the 1980s onwards, PASOK and New Democracy have always won at least three-quarters of the vote between them. This time, the polls suggest they will gain just one-third. The centre-right New Democracy seems almost certain to win most votes but with less than a quarter of those cast. At the same time, as many as eight other parties – most opposed to the austerity programme – could be elected. This is a recipe for instability at best and chaos at worst. What the ECB, EU and IMF will be looking for is whether thereâ€™s a majority in the new parliament to support the austerity programme aimed at getting Greeceâ€™s spending under control. There should be but itâ€™s entirely possible that such a majority is the result of the 50 bonus seats awarded to the party finishing first, leading to a crisis of legitimacy. Those fifty seats (up from forty last time) are likely to make up getting on for half NDâ€™s parliamentary party. On the other side of the equation, the proliferation of oppositionist parties may result in some missing the 3% threshold necessary to be elected. Whether the government could survive even if its supporters end up with a clear majority of seats when those opposed won most votes, is highly questionable and itâ€™s almost certain that the political battle would be carried on though strikes and protests. There is a surprisingly large number of betting markets on the Greek election, all through minor player bwin. That said, the lack of any published opinion polls in the last two weeks of the election campaign means itâ€™s tricky to pick out any obvious value bets. The second round of the French presidential election will probably overshadow media coverage of what happens in Greece. It shouldnâ€™t. This is one of the most important elections taking place anywhere in the world this year. 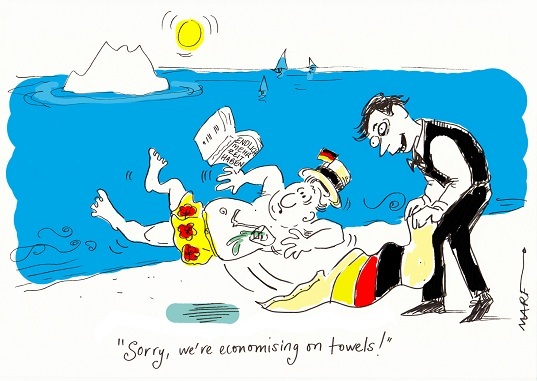 Does Boris hanker after Dave’s job? What’ll a victory next week do to his leadership ambitions? If both the national and London polls are reflected in next week’s London and national elections then Boris Johnson will be one of the few prominent Tories with something to smile about a week today. On a night that’s likely to see huge Tory losses, including possibly to their coalition partners the LDs, Johnson will have held on completely against the mid-term national trend. The message from City Hall will be loud and strong for the only way that Boris has been able to defy political gravity because he has special qualities not found at Number 10. Fairly or unfairly Boris’s performance will be compared with Dave’s and, no doubt we’ll have people saying that the national party could do better if led by the mayor. What could be electric is if a by-election vacancy comes up in a Tory seat. 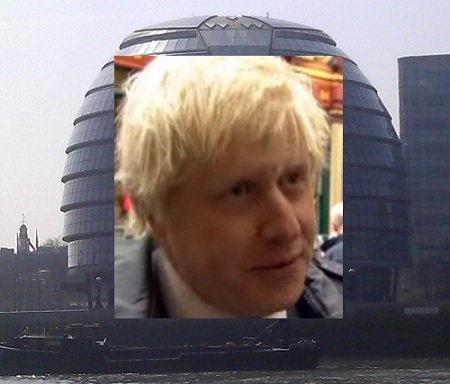 You can hear the speculation that Boris should put his name forward. Yesterday Dan Hodges suggested the the best mayoral outcome for Dave would be a Ken victory. I think he’s right. PaddyPower is offering 7/1 that next Tory leader is not someone currently in parliament – that sounds like a fair price and the bet would cover you for more than Boris. 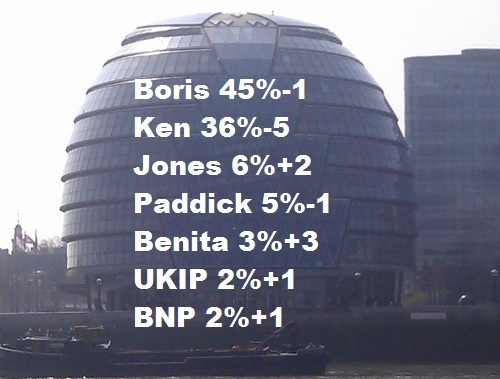 Which pollster will win the 2012 London Mayoral polling race? Is Ken’s deficit -2% or -11.2%? Make no mistake real elections where real results can be compared to real final polls are absolutely critical to the pollsters’ concerned. These are moments when reputations can be won and lost and can have big impacts on their commercial success. Next Friday three pollsters will be waiting in eager anticipation for the declaration of the results in the 2012 London Mayoral election. YouGov, the global pioneer of online political polling will be desperately keen to repeat its brilliant successes of the 2004 and 2008 elections when it got the final outcomes right to within one percent. It had a mediocre 2010 general election finishing in the bottom half of the accuracy table. A year later, last May, YouGov’s final AV poll understated the NO winning margin by more than 15% and the firm had a poor outcomes at the Holyrood elections as well. ComRes, which is based in the heart of Westminster’s media centre at 4 Millbank, has been expanding rapidly but has not polled a London Mayoral election before. It came in the top half of the 2010 general election accuracy table and came reasonably close last year with the AV referendum. Survation is the newbie political pollster which is building up a list of good media clients including the Telegraph for its innovative mayoral poll. Its online survey sought to present those being surveyed with replicas of the ballot papers that voters will be filling in. So which is going to win? No doubt they will all be doing final polls but you have to take notice of YouGov’s superb record with this particular election. Have you any suggestions for PB online polls? On May 20th Jacky and I are heading to Barcelona, Cadiz and Ronda for two and a half weeks. Unlike my previous holidays there will be not be the same level of posting on PB. We will put up open threads and a number of pre-prepared guest slots. I’m hoping that we’ll get the latest voting intention poll details up. One daily feature which we can set up in advance is a PB online voodoo poll. I’m looking for ideas for questions. The two pollsters who are carrying out regular London Mayorals surveys, and ComRes and YouGov are both issuing two sets of numbers when they publish their results. These are the first preferences of those interviewed and then their estimation of what the final split between the top 2 will be. The media is tending to focus on the latter which might be misleading. My view is that we should put our main emphasis on on the former. The experience of all the mayoral elections that have taken place in the dozens or so authorities where there are elected mayors is that the “supplementary vote”, as it is known, rarely affects the final outcome. There have only been two exceptions, at North Tyneside in 2005 and at Doncaster, where the winner was not the first in the first round. There are several reasons. Thirdly those whose 2nd preferences are not for one of the top two on the first round do not have an impact on the outcome. This can be quite hard to poll. There’s a new London Mayoral poll just out from Comres which is showing a very different picture from that reported on Monday by YouGov. It was inevitable, as the race gathered pace, that the top two would see some shrinkage as other candidates became better known. What’s striking here is how much Ken has fallen back compared with Boris. 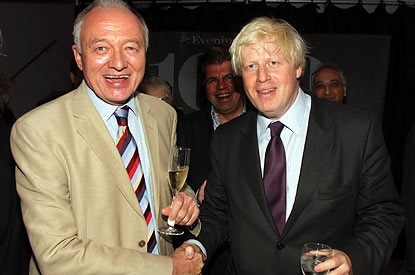 The voting intention question was – “In the London Mayoral are you intending to vote for Boris Johnson, Ken Livingstone, Brian Paddick or for another candidate?” There was only prompting for the three main parties. Ladbrokes have Jones at 12/1 for third place. Looks a value bet based on these figures. Was the Sun’s endorsement really so helpful to Dave? How come that afterwards there was such a big poll decline? So much has been talked about this week of the political power of the Murdoch empire that I thought I’d that it might be useful to reflect on the period before the last election. Look at the table of pre-election ICM polls above. 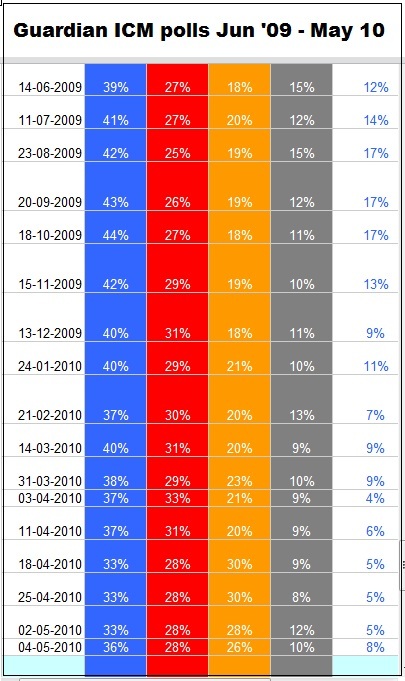 By September/October 2009, the time of the Sun’s endorsement, the blues were in the 40s with a solid 17% lead and looked all set to be returned with a comfortable majority. On election day the Tories secured 37% of the GB vote with Labour 7.3% behind, and crucially 19 seats short of an overall majority. So in the eight months that followed the Sun move the Tory lead dropped ten points. As a result of this week we know more about how Rupert Murdoch switched his support away from Gordon Brown in September 2009 when the announcement of the changes was splashed all over the Sun’s front page on the eve of Brown’s big conference speech in Brighton. The impact of the Sun’s decision was examined closely in Explaining Cameronâ€™s Coalition by Bob Worcester, Roger Mortimore, Paul Baines and Mark Gill, who concluded that almost all change in voting preferences amongst the paper’s readers had happened BEFORE the endorsement. The paper was just following its readers. But looking back I wonder whether the Murdoch decision might have had an impact on the overall media narrative causing the Tories to be scrutinised more closely. For however hard the party tried from January 2010 onwards the media became totally focused on what the Conservatives would do rather than what Labour had done. Maybe that was inevitable and it could be argued, of course, that without the Sun the decline in the Tory position would have been even greater.